The local property market is continuing to see encouraging signs with both prices and volumes recovering from the lows seen last year. 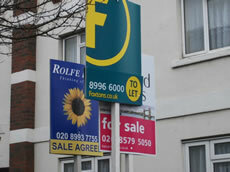 The average price of a property in the W3 area sold since the beginning of the year was £374,257. This compares to an average price in the fourth quarter of 2009 of £296,365. The figures for this year include the sale of a property on Twyford Avenue for £1,400,000, the fourth most expensive sale ever in the Acton area. Miles Shipside, commercial director of Rightmove comments: "A price jump of over 3% is more comparable to the pre-credit-crunch boom-times. Sellers are setting their sights higher, and some agents are going along with them in order to win scarce instructions. Property for sale remains scarce in popular areas, but new supply to the market has to be priced at what buyers are willing and able to pay. An average increase of over 7,000 pounds may prove to be a bit too spicy for some buyers' tastes, now that economic constraints have forced them to develop a simpler palate."